Live The Let Go Life: God's Will For A Carefree Lifestyle! Unending daily to-do lists. The frantic pace of modern living. The race to stay relevant in the face of disruption. The very real threat of superbugs and terror in our everyday lives... It's not hard to see why so many people today are experiencing stress, worry, and anxiety attacks. Unfortunately, these aren't simply innocent states of emotion-they can insidiously develop into chronic depression and psychosomatic illnesses, and lead to destructive behaviors. But here's the good news: While stress is depleting and debilitating, it can be defeated and driven from your life. Do you have a job that has a never ending to do list? Do you feel that you will never achieve a stress free life? Is letting go one of those things you've intended to do, but never actually done it? Is that nagging feeling eating you alive because in the pit of your stomach you live in constant anxiety? Everyday life is difficult, our culture is difficult and so is our time period, but isn't anymore difficult than the time that Jesus lived in, nor his disciples. They lived in a difficult time as well. This is a book that will help your breath a little lighter and find ways to combat areas where stress lives. I love how it helps you figure out and design how God created you to be. This book is relatable and it's authentic. 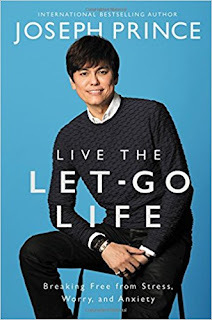 Joseph Prince writes with authority and he's relatable. I enjoyed this book and feel that the rest of the world could learn from ways of handling stress and anxiety through him. You aren't going to live a stress free life style, but you can learn how to manage it better and differently. I think this book should be recommend for all American's particularly all college students as this is a stressful time in their life. I didn't not agree with all of his writing, but I thought for the majority, it was written very well. I give this book a 4/5 stars. A favorable review was not required. Thank you the publishers for providing a complimentary copy for review.